Picturesque medieval buildings dot the landscape of Verona, a quaint Italian city which is the famous setting for Shakespeare’s play, Romeo and Juliet. But while exploring the old world charm of this city, we came across a stunningly futuristic and lavish apartment, the Penthouse Villa Lieta. Rendered by the innovative architects at RWA Architetti, white dominates the abode generously along with light wooden hues and glass for an extremely trendy and neat look. 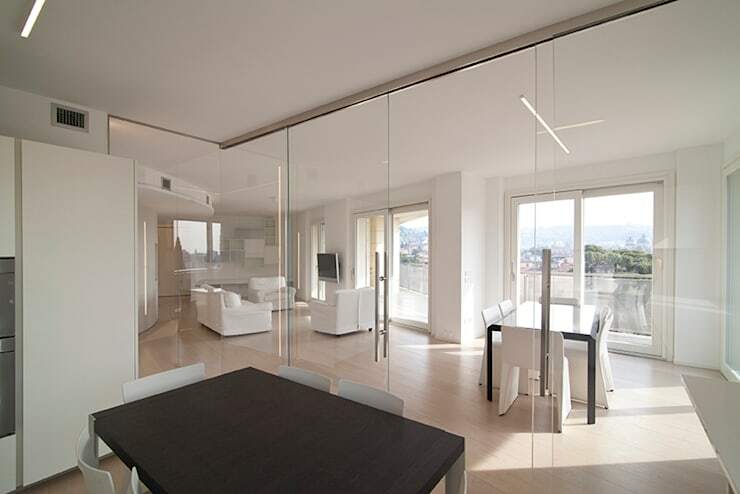 But what blew our mind is the use of curved walls with hidden doors and classy glass partitions for the interiors. Despite following a contemporary open plan layout, none of the functional spaces barge into each other. 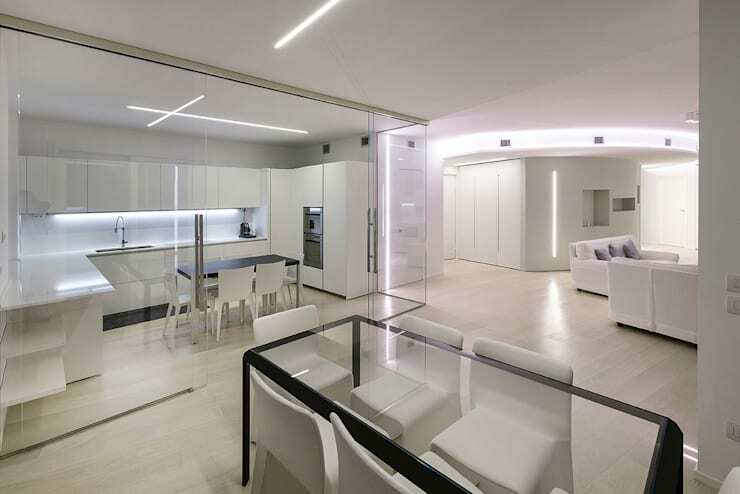 Subtle privacy, minimalism, smooth surfaces and brilliant lighting come together for a heady concoction of style and convenience in this apartment. For a moment, we felt as if we had stepped into a spaceship! What a minimal yet attractive living space! Plush white couches with rounded contours make relaxing here a pleasure, while grey cushions offer elegant contrast. The pale wooden floor goes very well with the sharp white interiors, while creatively rendered recessed and accent lighting exudes a futuristic vibe. The curvy surprise of the home greets us with the wall on the right. Let’s take a closer look, shall we? 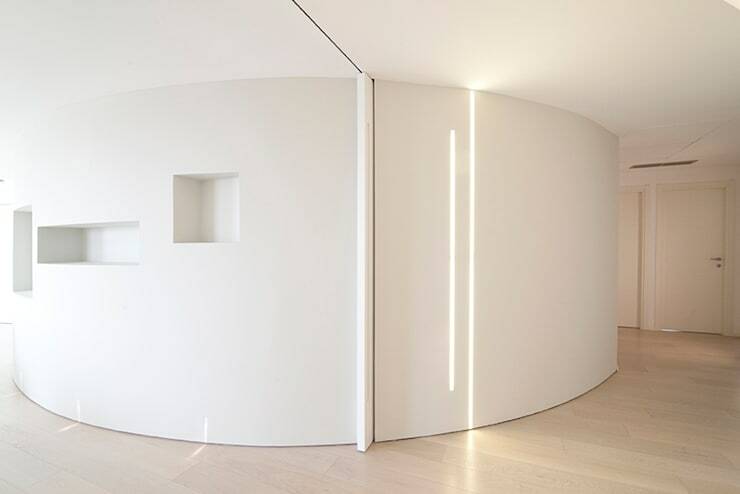 The perfectly curved walls stand on either side of an almost invisible sleek sliding door which merges with the walls when left open. It can be drawn out from the slim recess if you want to cordon off the common areas from the more private quarters of the abode. The brilliantly designed niches are perfect for displaying artefacts, while the thin strips of lighting add pizzazz to the space. While the curved walls we just saw ensure the fluidic nature of the home, glass makes a powerful statement in the kitchen and dining areas. The glass-topped black dining table is smartly accompanied by chic white chairs, while the large kitchen is bounded by floor to ceiling glass for a delicate sense of privacy. We love how this demarcates different functional zones without compromising on the residence’s openness and expansive feel. Gleaming white and minimalistic cabinets cater to storage needs in the conveniently U-shaped kitchen. There is ample space to move around, prep and cook. A large window brings in glorious sunlight, while chrome appliances make for a trendy touch. Minimalistic fixtures and a simple breakfast table with stylish white chairs reinforce the fuss-free elegance of this space. From the kitchen, you can not only view the living and dining areas in an unhindered manner, but also soak in the sight of the sunny and large terrace. Large glass sliding doors lead you from both the living and dining areas to the airy terrace outside, where you can catch a sweeping glimpse of the city. This way, sunlight floods the home throughout the day and celebrates its pristine whiteness. The sensuous and soft appeal of the bathroom is due to the curvy glass encasing the shower nook as well as the smart sink cabinet. 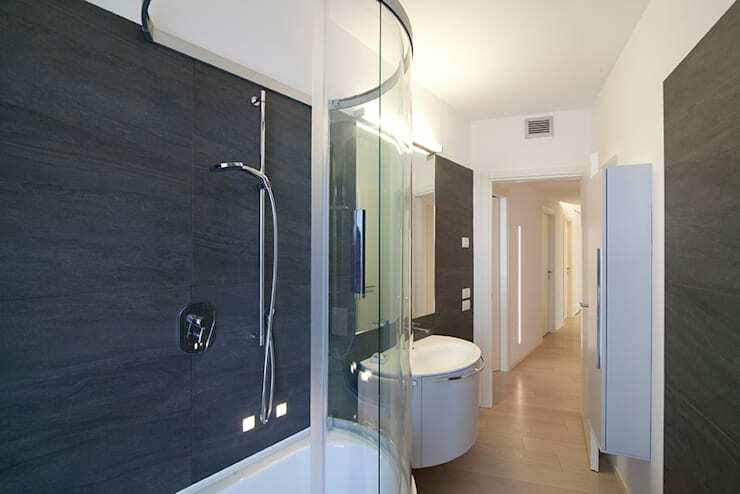 Slate grey tiles break the monotony of white here, and helps the bathroom to stand out from the rest of the apartment. Minimalistic fixtures and recessed lights guarantee sheer bliss during rejuvenation sessions. Inspired by the unique designs and creatively rendered touches in this white and stylish Italian abode? Check out another home tour for more ideas - This Wonderful Wood House Draws Your Gaze.